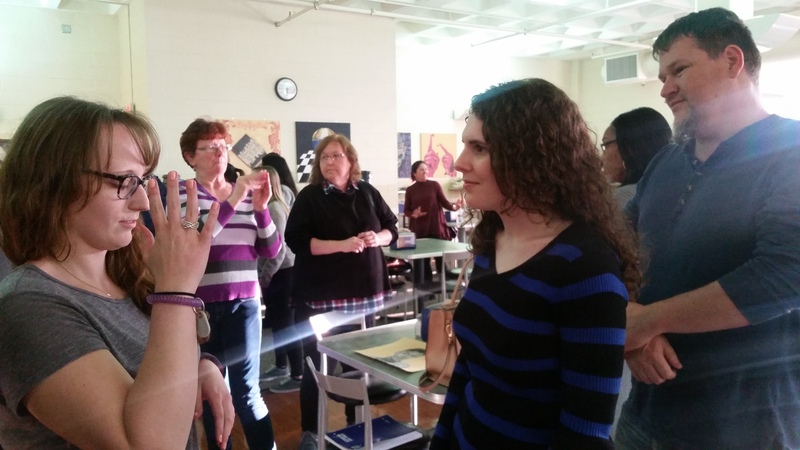 BLACKWOOD – About 50 people participated in the Camden County College American Sign Language Club’s Sign and Switch game night in the Blackwood campus cafeteria April 10. The event was open to deaf people and to Camden County College students learning American Sign Language. At 6 p.m. the night kicked off with a game of Whisper down the Line. Participants stood in lines and tried to copy a series of signing to the end of each group to see what was retained of the original phrase. 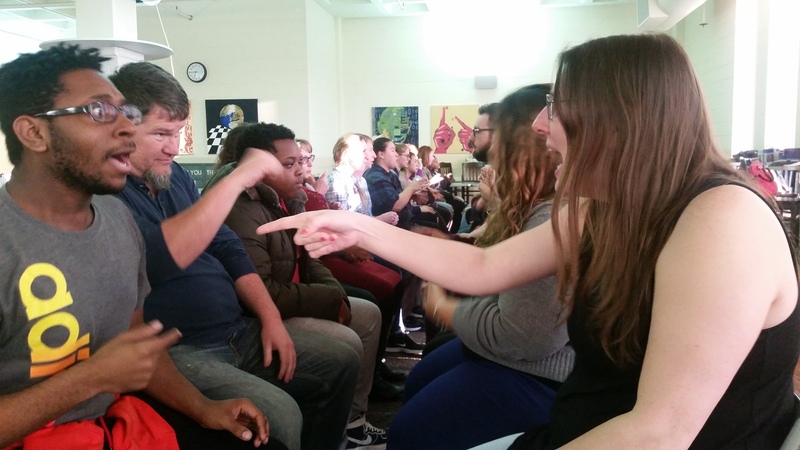 “It is a great icebreaker because you don’t necessarily need to be great at signing yet to play,” said Kerry Ceccanecchio, co-adviser of the ASL Club and adviser to hearing-impaired and deaf CCC students. Minimal words were spoken, yet the room was filled with conversations at all times and bursts of laughter often were shared among the participants well into the next activity. Sitting in two parallel lines face to face all attendees played a game that was much like speed dating, talking to the person across from them for two minutes in sign language only, then the line shifted and they met the next partner. When speakers were seated side by side it was easier to tell who was fluent and who was learning still. “There is such a difference in levels of skill of ASL, and some people are learning, some people have done it for a while, and it’s interesting to meet everyone,” said Danisha Tucker, the president of the club. She stated her son enjoyed interacting with members of the community at other levels as well, playing around and assisting others who were not yet fluent. Those who have signed for a long time or do not speak showed many more facial expressions and used grander motions than those who were still taking classes. Participants, like the several students of Overbrook High School in attendance, who still have much to learn were as welcome as anyone to the club’s events. Ceccanecchio assured the deaf community is warm and inviting to anyone willing to try. The event continued with a pizza dinner and desserts while the conversation continued and the night wound down. Though many beginners started to speak verbally again all levels still engaged in sign and continued to get to know one another and connect. The ASL Club will hold another event April 20 in Civic Hall in the Connector Building from 6 to 8 p.m. The Second Annual Deaf Panel of Special Speakers will feature deaf speakers who are professionals in their fields of work. Vocal interpreters will be provided for those who cannot sign and refreshments will be served.